In the tradition of highly-successful romantic action comedies comes a one-of-a-kind love story in “Mr. Right” starring two of Hollywood’s well-sought actors Anna Kendrick and Sam Rockwell. In “Mr. Right,” Martha (Anna Kendrick) discovers that her new beau, Francis (Sam Rockwell), is a professional assassin… with a cause. He kills the people ordering the hits. As the bodies pile up, Martha must decide whether to flee or join her man in the mayhem. Sam Rockwell is that rare Hollywood star who's equally adept in somber dramas like the most recent Broadway revival “Fool For Love” and BAFTA award-winning “Moon” as he is playing quirky characters in such black-humored action fare “Seven Psychopaths” and “Confessions of a Dangerous Mind.” When director Paco Cabezas met with the actor in late 2012, Rockwell immediately responded to Mr. Right 's subversive sense of humor. "I said 'yes' right away because Max Landis wrote a really fun script that reminded me of movies like “Grosse Point Blank” in the way it mixed action and romantic comedy," he says. "I saw Mr. Right as being kind of like Mr. and Mrs. Smith-meets-Silver Lining Playbook where you have two dysfunctional bi-polar type people who find each other. They're both hot messes, on edge and scary. Francis and Martha might freak other people out, but they don’t freak each other out." Kendrick also sparked to Mr. Right because she knew Rockwell would be playing the title role. "I always pictured Mr. Right as Sam," she says. "I knew he would bring amazing energy to the character. He makes you love this guy who’s killing people. but because it’s Sam playing Francis, you’re rooting for him." Producer Jacobs says "Often times with movies in this genre, you see the female lead running scared once the gunfire starts. We needed to find an actress who had that America's sweetheart girl next door quality, but underneath all of that, in Mr. Right, the gunfire kind of turns Martha on. Anna knew how to pull off that turn." The movie veered away from using CGI trickery in favor of old-fashioned physical fisticuffs. "I'm tired of watching action movies plagued with digital effects where nothing is real," Cabezas explains. "In Mr. Right, everything's real. 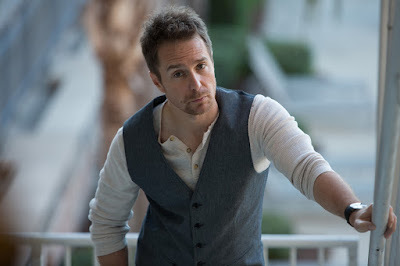 Sam Rockwell did 99 percent of the action himself, and he did it with grace and speed." Rockwell rose to the live-action challenge. "I’m not formally trained as a dancer but I have been boxing off and on for twenty years so that helped a lot with the lateral movement, feet agility, that kind of crap," Rockwell explains. "It’s all the same stuff." Blending dancing, violence and romance into one-of-a-kind hybrid entertainment, Mr. Right aims to seduce audiences with its twisted take on the classic boy-meets-girl formula. "I don’t have a clue how to categorize this movie, and that's what I love about Mr. Right," says Cabezas. "It’s funny, it’s a thriller, it has action and a lot of heart. In that sense, it's an explosive cocktail. I love movies that are great roller coasters of emotion, where you never know what to expect. I hope people who see Mr. Right have a laugh and have a good time and say 'Wow, I wasn’t expecting that.'" Rated R16 by the MTRB, “Mr. Right” opens April 6 in cinemas from Pioneer Films.